Polistena is a suburb of Serre situated midway between the Ionian and Tyrrhenian coasts of southern Calabria. Finds dating back to the Neolithic and Magna-Greek eras have emerged on its territory and tell of some settlements arising from various eras. Being a midway road between the Locri and Medma (Rosamo) Polistena colonies, it could have been a intermediate mail station. What is certain and documentable news, emerges beginning during the X century, but hypothesises that activity of the Basilian monks also gave life to the centre during previous centuries. The 1783 earthquake destroyed Polistena, causing the death of more than two thousand people. The inhabitants decided to rebuild the suburb a short distance away. It is the native land of the poet Raffaele Valenzise (1852-1838). There are some imposing churches to visit in Polistena: the S. Marina Matrix, which preserves the Pala Marmorea of the Deposizione (‘500s) and 17th century canvases, the Trinità Church, the Immacolata Church with classical lines and cupola, S. Francesco and the Rosario Church with a Baroque façade. 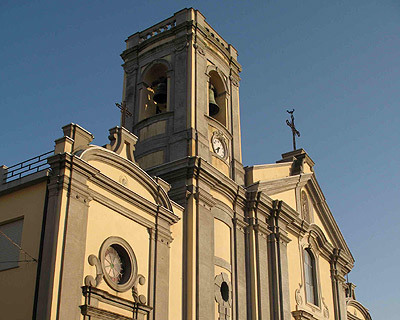 Not too far away, one can also visit the Medieval suburb of San Giorgio Morceto.